As we get older, our sleep patterns change. We spend less time in deep sleep (REM) and dreaming than we did in our youth. We may have problems falling asleep (sleep latency) or staying asleep (sleep fragmentation), sometimes waking repeatedly throughout the night. We may wake up tired and be sleepy throughout the day. So how do older adults get the recommended seven to nine hours of sleep they need each night? We know that, at any age, we need quality rest to be healthy. Sleep allows our body to rest and restore its energy levels. Without it, we can suffer a host of sleep-deprivation problems, including depression, irritability, memory problems, difficulty concentrating, increased risk for accidents and an overall reduced quality of life. 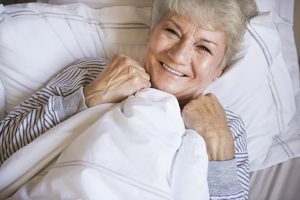 To mark National Sleep Awareness Week, let’s look at some common sleep problems associated with aging and offer some tips that may help you achieve a restful night’s sleep – this week and every week. Illness or pain: Feeling sick or being in pain can make it difficult to sleep. Health conditions like arthritis can be painful and keep you awake in bed. Diabetes or an enlarged prostate can cause frequent nighttime bathroom trips. Medications: Some prescription drugs make it harder to fall or stay asleep, or they may even stimulate you to stay awake. Worry or grief. Aging brings many life changes. Losing a loved one, moving from your family home or going through an illness all can be stressful, which can hinder your sleep. Sleep disorders: If your sleep problems are persistent, you may have a medical disorder. See your doctor if you think you suffer from insomnia, snoring and sleep apnea, restless legs syndrome, periodic limb movement disorder, or REM behavior disorder. Too much downtime. Many people stay active well into their golden years. But if your days are too idle, you may find it harder to get good sleep. Follow a regular schedule. Go to sleep and wake up at the same time each day, even on weekends. Keeping a regular sleep schedule sets the body’s circadian clock, a 24-hour internal rhythm affected by sunlight. Waking up at the same time each day is the best way to set your “internal clock,” even if you did not sleep well the night before. Sleeping in to catch up on lost sleep only perpetuates the problem. Develop a bedtime routine. Do the same things each night to tell your body that it’s time to wind down. Make the transition with relaxing activities an hour or so before bed, such as reading a book, listening to soothing music or soaking in a warm bath. Keep electronic devices out of the bedroom: The light from your television, computer, cell phone or tablet can stimulate your brain and make it difficult to fall asleep. Also, avoid stressful, stimulating activities at bedtime. If you tend to take your problems to bed, try writing them down and then putting them aside. Use your bedroom only for sleeping. Give yourself about 20 minutes to fall asleep. If you’re still awake and not drowsy, get out of bed. Struggling to fall sleep only leads to frustration. Go to another room and do something relaxing, like reading or listening to music until you’re tired enough to sleep. Avoid too much daytime napping. A 20-minute power snooze can improve your energy and help you get back to your day recharged. But long or late-day naps can be problematic for sleep sufferers. If you must nap, keep it short and before 5 p.m. Exercise regularly. Daily exercise improves the quality of your nighttime sleep and helps you sleep more soundly – as long as it’s done at the right time. Try to finish exercising at least three hours before bed or work out earlier in the day. Avoid caffeine, alcohol and cigarettes: Caffeine and nicotine are stimulants that can keep you awake and should be avoided at least four to six hours before bedtime, or entirely. Even small amounts of alcohol can make it harder to stay asleep. Whatever you do, don’t accept being tired as part of getting older. When you improve your sleep, you improve your health and longevity. If you or a loved one is struggling to get rest, there are a multitude of resources available to assist you. FirstLight Home Care can provide the help you need for daily living so that you can find the peace of mind that will promote healthy sleep habits. Find a location near you today, and you’ll be on your way to a better night’s sleep.